Thank you to everyone who contributed such delicious recipes for our gluten-free Thanksgiving challenge. My goodness, people! Not only did the original bloggers who posted about their own gluten-free baking challenge blow me away, but the hundreds and hundreds of links to great gluten-free food in the comments could keep anyone baking for months on end. If this is your first gluten-free Thanksgiving, there is no need to suffer. None at all. However, I know that a number of you out there have problems with dairy, as well as gluten. Others can’t eat eggs. Some of you are vegan by choice. Trying to bake without gluten, dairy, or eggs can be daunting. That’s why we’ve made you some pumpkin pie. Danny and I spent much of this fall trying to come up with gluten-free, dairy-free, egg-free dishes for Thanksgiving. Pie was top of the list. For me, Thanksgiving just isn’t the same without pie. If you want truly flaky crust, make this dough the way you would make a rough puff pastry. Starting with a shaggy dough, then folding, chilling, rolling out, folding, and rolling out, then chilling before putting rolled-out dough into a pie pan makes a super-flaky crust, light as air. However, since it’s just before Thanksgiving, I put the much easier version here. Later you can perfect your crust. Feel free to substitute the fats of your choice. I tried coconut oil here but I just didn’t like it. The coconut oil melted in the crust, making it run. And also, the pie tasted like coconut, which didn’t thrill me. I’ve been told that palm oil, which I have not worked with yet, is great in vegan baking. Perhaps you can tell us what works best for you? For the filling, I used this recipe. Other than being a bit heavy on the molasses (I would probably cut it out next time), this filling was delicious. I like the idea of using a simple syrup for the sugar, since that thickens the filling without using eggs. I might just do that for our Thanksgiving dinner this week. Cube the buttery sticks and Crisco into 1-inch pieces. Lay them gently on the flours. Put the bowl in the freezer for 15 minutes. Working quickly, take the bowl out of the freezer. Using a pastry blender or your hands, work the fats into the flours, coating the fat. Stop when the fats are the size of peas. Don’t go too far. You still want to see the fats in the flours. Pour the water onto the mixture. Stir gently with your hands. You are looking for the flours/fats to be just wet enough that it will stick together when you pinch it. You might need a tablespoon or two more water, depending on the day. If you add a bit too much water, thats okay. Its better than a dry dough. Bring the dough together into a ball. Flatten it, gently, into a disc. Wrap this in plastic wrap. Put the dough out of the refrigerator. Lay down 2 pieces of plastic wrap (you can also use wax paper or parchment paper), then put the disc of dough on top of the plastic wrap. Cover the disc with enough plastic wrap to be able to roll out the dough into a 10-inch circle. When you have rolled out the dough into a large circle, lift up the top layer of plastic wrap. Gently lift the pie dough and fit it into a 9-inch pie pan. Settle it in gently. Dont stretch or push it around too much. Dont worry if the dough breaks. Take small pieces of the dough and fill in any holes, smoothing the dough with slightly moistened fingers. Crimp the edges of the pie dough. Put a buttered piece of aluminum foil onto the bottom of the pie dough, nestling it gently against the sides. Fill the foil with dried beans. Great recipe. I can do eggs, SOME dairy, but no gluten and really, why would you when there are amazing recipe like this… yum. And thanks for the filling recipe too! I can't wait to start baking/cooking/recipe-making! p.s. I just bookmarked your gluten-free stuffing recipe- thank you! We're using a GF pie crust recipe that calls for 1/4 cup cream cheese, and it is really good (I found it on the blog "A Baking Life"). I haven't tried any others though, so I may have to give this one a try for Christmas! I had some great GF treats at Saturday's Will Bake For Food event. People are doing some really great things with gluten free flours! I am totally impressed. What a delicious pie recipe! It's so wonderful that it's also dairy-free. Thank you for sharing, Shauna! I was just doing a search for this last night. I will use palm shortening instead of Crisco because we cannot have soy either. How about a pumpkin pie filling that is GF, dairy, egg, and soy free? Oh, and when we still cooked with gluten I'd use vodka to my crusts to make them easier to work with. Would that help with GF crusts too? Sounds great! I would like to try this crust w/my usual pumpkin filling but I don't usually blind bake for pumpkin pie. Does this crust require it? Terrific! I love that you came up with a GF and vegan pie crust. I'm making a Chocolate Pecan Pie tomorrow and will use your crust. I hope to blog about it tomorrow as well. Thank you Shauna and Danny! I've been walking the green mile on a GF/DF/EF pumpkin pie and by the looks of it…SCORE! Thank you both so much, you really are my heroes. It's perfect, gluten-free and also dairy-free. Any tips for a dairy-free pumpkin pie *filling*? I did a trial run with a recipe that used silken tofu in place of condensed milk and eggs, but the consistency wasn't quiet there. For lactose-intolerant me, who has gone without pumpkin pie for a few years now, the flavor was heavenly (and much missed), but the pie did not pass muster with the lactose tolerant. I would love to have one pie that could make everyone happy (and that no one will have to know is dairy-free). Ideas? You might try using coconut milk (not lite) or cocounut cream in place of condensed milk. 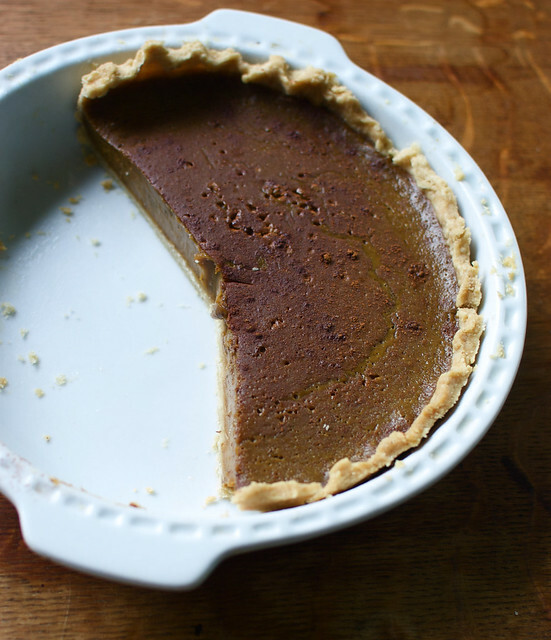 I can't wait to make this pie crust recipe this morning (and my 2-year-old will be helping — should be interesting!). For Carly, who asked about making a dairy-free filling: For years I've made the pumpkin pie recipe on the Libby's can, simply substituting canned coconut milk for the canned condensed milk that the recipe calls for. I usually use the Thai Kitchen brand of coconut milk — it's unsweetened and seems to have enough fat to help the pie filling come together. I LOVE the the way that pie filling comes out! It does taste of coconut, but to me that's a plus. Note: it has to bake longer than the recipe calls for, but does solidify in the end. Thank you, Shauna! I've been trying to find a tasty pie crust that I could eat and still please my non-gluten free Mother and gluten free-but-not-dairy-free father! This looks great! Can't wait to try it out! (though we don't have a scale and it seems different flours are denser than others so a simple conversion to volume might not work). One question though, is there a way to make the crust for top (for an apple pie for example)? We may just "wing it"…. I've really enjoyed some of the baked goods I've had with palm oil, but PLEASE make sure your palm oil is sustainably grown. Happy Thanksgiving everyone! I'm wondering if anyone can help me troubleshoot my pie crust. I had a lot of fun making it for Thanksgiving, but it did not come out the way I expected. I used our (non-digital) kitchen scale. I did not have guar gum, so I used 2 tsp xanthan gum (instead of 1 tsp). For the fats in the crust I used 4 oz of Earth Balance's soy-free, dairy-free spread, plus 2 oz of Spectrum's Palm Oil Shortening. The main issue was that the crust was very hard and thick, making the pie difficult to eat. It didn't get flaky at all. I think the fats that I used did not contribute good flavor, either, and with a thick crust, that was a big issue (the taste was off putting). If the crust had been very thin, I might not have noticed the flavor of the fats as much (i.e. I've used just Spectrum Palm Oil shortening in really thin gluten-free crusts, and thought it tasted fine). I can think of a few things I did that might have caused the crust to be so hard: 1) substituting the xanthan gum for guar gum; 2) trying the soy-free, dairy-free spread for the first time; 3) not trusting my instincts and rolling the dough thinner; or 4) putting too much shortening on the bottom of the foil used when the pie shell was pre-baking (I had to take it out early and sop up the oil from the crust – oops). How did this go for everyone else? We're having a 2nd Thanksgiving meal on Saturday with our family, and I'm eager to bake Version 2 of the pie. 🙂 I'm going to figure this one out! I'm a day late! My brother in law is gluten free and had to buy his own pie which didn't taste all that great. I"ll forward the recipe onto my sister though. OMG…. I made this for Thanksgiving at my firestation, and prayed the guys would like it. I doubled the batch for a pumpkin pie, and a pecan pie. It was a hit. One of my crewmates said, "That was the best pie crust I've ever had!" THANK YOU! I made the same pie crust and wondered if it made two when I rolled it out. And my crust (I made a pecan pie) came out hard as a brick. Literally, it was impossible to cut. I was so disappointed. I used my scale and the only thing I did differently was use Earth Balance shortening instead of Crisco, because that is what i had. I just want to thank you SO much for posting this recipe. 2 weeks before Thanksgiving, I got news from my doctor that I can no longer eat gluten, eggs, or dairy. And, I have been really struggling with that news, especially around the holidays. But, seeing this gives me HOPE!! Thank you, thank you, thank you. I think I will try this with the soy-free Earth Balance and use coconut oil instead of Crisco. I’m vegan and trying to remove gluten and soy. I’ll let you know how it goes! 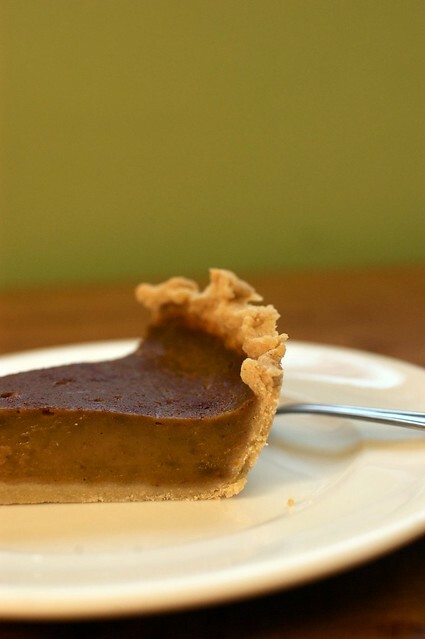 I was so delighted to come across a pie crust that was vegan in addition to gluten free! I did not have crisco or guar gum so I just doubled the xanthan gum, and used whipped earth balance in the tub as it is what I had on hand. I rolled it out really thin between 2 pieces of parchment, and pre made mini crusts in foil tart pans to freeze and use in the future for personal sized pies, quiches and pot pies :)…. ( I was able to get 10 miniature pies out of the recipe) I was very pleasantly surprised when transferring the rolled dough to the plate, that I was able to peel it right off without carefully nursing it from the parchment. it had a lot of stretch to it, and didn’t even tear once… imagine that! My only complaint was the extreme saltiness of the crust, which could be my own tastebuds working against me as I almost never salt my food, and the earth balance in itself it quite salty. Thank you so much for this versatile recipe! Hands down my new favorite pie crust recipe. I can’t have corn, so I substituted tapioca flour. Also, I can’t have xanthan gum, so I doubled the guar gum. I also never have the patience to put the crust in the fridge or freezer. I just plop it in the pie crust and spread it thin with a wet spoon or wet fingers. I do the same thing if I am doing a fruit pie with the crust on top – just smoosh it on. This recipe works great even with the smooshing technique rather than the rolling technique. Quick Q: are all of the ounces by weight, not volume? I’m going to assume yes except for the water, which I assume is fluid. BTW, with GF, DF, we found that “vegan” is a handy substitute search term when googling recipes. But it was pretty funny when my wife became exasperated last year because she couldn’t find a recipe for vegan turkey meatloaf. Oops. Hee hee! Hi, This recipe looks awesome! And possibly do-able for me. I’m new to cooking. Being gluten, egg, soy, casein, yeast free (plus about 6 others) has forced me to learn to cook. So I have a question that may seem silly…. When the recipe says ounces, is that by weight or by measurement? Because my measuring cup has ounces listed. But I wasn’t sure if it works out the same. Thanks for any help. I look forward to making this for my girls and I who all have the same allergy free lifestyle now 🙂 Thanks!! It’s by weight. You’ll need a kitchen scale. And you won’t regret that purchase! How can I make this without xanthan gum? Natalya, I made this yesterday substituting equal measures of ground flax seed and ground chia seed for the gums. It turned out great when I used Earth Balance buttery sticks. It did not turn out well when I used Nucoa buttery sticks – the pie crust melted right off the edges of the pie. I’m shocked that you include a hydrogenated fat like Crisco in your recipe!!! What the hell crisco isn’t Vegan…….. Spectrum makes a non-dairy shortening that works well here. Could this recipe work for making pie pops? I am oh so grateful I stumbled across your website. This was my first Thanksgiving gluten free (I am also Vegan by choice). Your recipe and directions were easy to read for a first time baker! The only thing I noticed was that the crust darkened more than I would have liked and was a bit bitter but the rest of the pie was perfect! Any ideas on what I can do different next time? Maybe bake the crust less time at the end, i.e 5 minutes instead of 8? I do not want to compromise the rest of the crust as it was perfect!